It retailed for $40-50 a bottle. It's fetching black market prices of $350 a bottle. It's aged in barrels for a whiskey that itself sells for $250 a bottle. 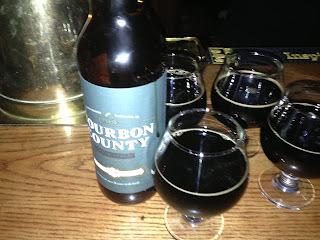 I am and pretty much could only be talking about Goose Island Bourbon County Rare, the discontinued version of the BCS line that was aged for 2 years in barrels of 23-year-old Pappy Van Winkle. Pappy is arguably the hottest and scarcest bourbon on the market, so it is of no doubt that a beer aged in it would generate tremendous buzz. Goose released bottlings of BCS Rare in 2010 and 2011. Lines were long, shouting matches ensued among customers vying for a bottle, fight scenes erupted akin to the Anchorman scene where the news teams gang fight - with tridents. Okay, it wasn't nearly that violent, but next time they release this, try line jumping in plain view and see what happens. Naturally, the question is whether all of the hype surrounding this beer is even remotely justified. I recently found out for myself. A bar was offering a bottle of this for $90 and we had good-sized group of beer fans who would appreciate something this hard to find and this elaborate. Heineken drinkers need not apply. There's no point in wasting this precious commodity on anyone who wouldn't know this from a Bellhaven nitro stout. As you can see in the bleary photo, we split the cost among our group in order to lower our individual access points to the market. None of us would awake in shame the next day for having purchased this beer for the price of two Costco memberships. So, Mark, how was it? It's very impressive. If you've had standard BCS, which is an outstanding beer that's seems to be far more available than it should be, you know that when it's young, it's sweet and is hot with alcohol. BCS Rare takes away the edge from the alcohol, and you can smell the difference. You get a nose of sweet bourbon, chocolate and some molasses, maybe some pumpernickel. The beer itself is oily black and leaves a trace of a tan-colored head around the circumference. It's mouthfeel is pillow soft, almost delicate. It's so feathery that you can almost feel the scorn being heaped upon you should you gulp instead of sip it. It's rather sweet, like chocolate nibs, and this catches up to you in time. Unlike standard BCS, and beers like KBS and Bell's Black Note, the bourbon on this is so caramel and honey-like that it almost makes this seems a bit like a liqueur. Carbonation is rather low. There's vanilla and a bit of dark cherry and blueberry in the mix, but it's not remotely tart. It finishes long, silky and sweet. To achieve these effects with a beer is pretty damned remarkable but I wish this had a bit more bourbon, hops, or rye bite to it, just to give it some additional edge. As for the verdict, as Shaun would so structure his posts, I would say that you should save your money on this. Spring for a bottle only if you are going in with friends. This is a great beer but is not otherworldly. Given the size of the bottle and the the beer's sweetness and density, it would be difficult to go alone on a bottle in one sitting. Its high ABV would overtake you around the point you were finishing your second snifter anyway (can you imagine some wino chugging this from a paper bag? Egads. ), diminishing your returns during the last third of the bottle. In other words, bring a friend, and, especially, his money into the equation. Or get your girlfriend to buy it. That's a lot of reciprocal shopping trips to endure but your suffering at Anthropologie will be worth it if she's footing the bill. you'll probably be smashed any way, so all the women will look good. Have a good trip buddy.